The first book to focus on the entire process of lead management, not just front-end advertising and marketing Comprehensive and revolutionary, the three-step Real Estate Rainmaker system illustrates tested and proven techniques every sales person can use immediately. It also illustrates how readers can avoid the biggest mistake most salespeople make when they advertise properties alone--without the wider appeal of a direct response offer. 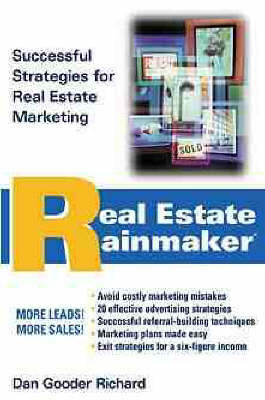 Real Estate Rainmaker details twelve easy techniques to increase advertising results for no additional cost with proven direct response and lead generation techniques. Includes direct response copywriting and design, telemarketing, brochures, building a customer data base, and more. Dan Richard (Fairfax, VA) is founder and President of Gooder Group, a publisher of real estate marketing materials, featuring six monthly real estate newsletters and a wide selection of marketing tools, including brochures and handbooks.